Richard and his family will be taking a well-deserved holiday in Mexico next week, so the venue for our meeting on Thursday January 20th has been moved from Perks pen store to the WHITE SPOT restaurant inside Oakridge Mall (Oakridge Mall is located on 41st Ave & Cambie St. in central Vancouver). There is ample 4-hour free parking at Oakridge and the "Oakridge-41st Avenue" Skytrain stop is right in front of the mall. Richard has booked several tables (that can be pushed together to accommodate a large party of up to 20 people) in a separate dining area of the restaurant, with the agreement that some of us will be ordering food or drinks (which I think it pretty reasonable, given that we'll be in a restaurant :). Many thanks, Richard! Don't forget to bring any Aurora writing instruments (pens, pencils, rollerballs) for our January theme, as well as any new acquisitions to show. Hope to see you there! 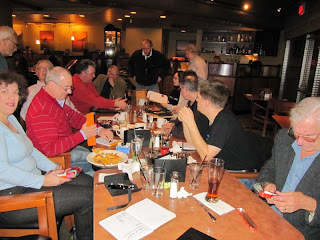 Update-Oct 30, 2011---Just found a photo taken by Bill K. at the January 2011 meeting above. It was held at the White Spot restaurant in Oakridge Mall and I think we all had a good time---good food, good pens & good company!